Seeking a special view of Mt. Suilven, I hiked across some grazing land soon after a rain shower in the hope of finding a vantage point across Cam Loch. 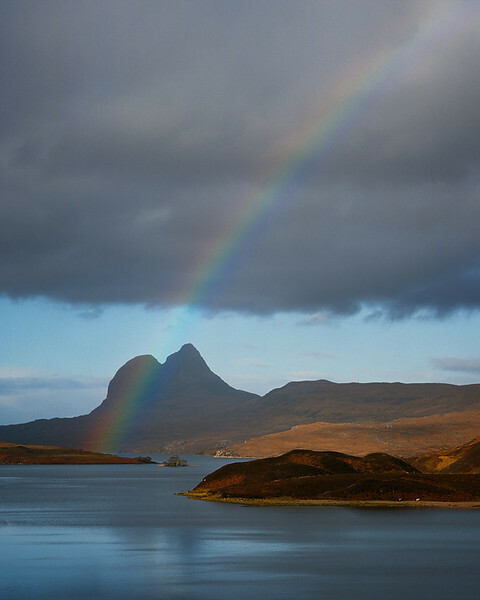 As I came over a rise in the hill, I caught a glimpse of a rainbow across the loch. I had just enough time to set up my camera, frame the image, meter the exposure and press the shutter release cable before the light changed and the rainbow faded.